When we are working at a difficult task and strive after a good thing, we are fighting a righteous battle, the direct reward of which is that we are kept from much evil. As we advance in life it becomes more and more difficult, but in fighting the difficulties the inmost strength of the heart is developed. Indeed life is a have to defend and protect ourselves, and with a cheerful and brace spirit we must battle; we plan and calculate in order to make progress. rumor has it that lil one, the cat seen above is pg. I'm secretly hoping that one of her kitties will be orange. since she's almost a part of the family, perhaps I can make a good case for adopting one of the kittens when they are looking for homes. lil one lives at the house where t&r (who are part of the family) live. technically she's their neighbor's cat, however, lil one has claimed all the humans (and dogs) who reside in the house on avenue w as hers. 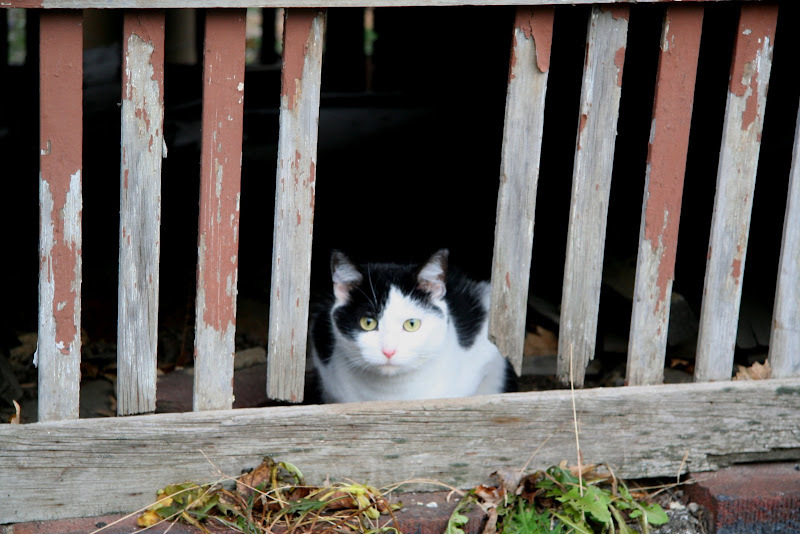 t&r's neighbors have yet to subscribe to the wisdom of spay and neutering their animals. you can bet that I'll working on that. I'm thinking after lil one has her kitties of volunteering to take her in for an operation as a gift to the household. My mam don't dance and my daddy don't rock and roll. It's so important to spay and neuter. Sigh. I hope you can convince your neighbor that it's the WAY! i like her hairdo reminds me of someone. Taking mama cat in for a spay would indeed be a great gift. When is she due? Maybe she'll have Xmas kittens?